Personnel - Stephan Crump: acoustic bass; Liberty Ellman: acoustic guitar; Jamie Fox: electric guitar. Stephan Crump plays the bass with a sturdy hand and disciplined passion. His auspicious note displacements and impeccable notions of tempo made him not only a first choice sideman (Vijay Iyer, Rez Abbasi, Liberty Ellman) but also a highly respected bandleader, responsible for exciting projects such as Borderlands Trio, Rhombal, and Rosetta Trio. It is precisely the latter group that has a new album, the fourth, on the way. 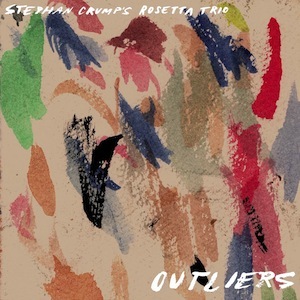 Outliers offers glittery collective lyricism, prismatic improvisations, and a courageous unconventionality through complex yet deeply engaging structures. Crump has put this trio together in 2004, picking guitarists Liberty Ellman and Jamie Fox as associates. The opening tune, “In Waves”, turns loose pleasurable electro-acoustic sounds, displaying a certain type of guitar strumming and strokes that made Emerson, Lake & Palmer’s “From The Beginning” popping up in my head. This worked as an unexpected and quite nostalgic art-rock moment for me. Also on the fringe of a refined rock but additionally bringing something more in its guiding staccatos, the title track complies with ravishing shifting practices. Rhythmically puzzling, it passes the sensation of an African dance fused with rock erudition. Performed with impassioned abandon, “Synapse” is pure, bright fusion. It exposes funk-rock caught in intricate unisons and smooth flamenco-like passages in 5/4 with alternate solos by Ellman and Fox on the acoustic and electric guitar, respectively. And because it’s impossible to guess where the band is going to take us next, “Cryoseism”, the first compositional contribution by Ellman to the group, is another fusion tale, only this time blending fizzy funk with the type of classical wonder often suggested by Yes’ guitarist Steve Howe. On “Eskima Dream”, a tune retrieved from the Rhombal album, there is more scintillating funk, and the tenacious bass bounce joins the chordal guitar flourishes in a danceable ritual in seven. The group impresses in a similar manner when tackling slower tunes like “Re Eyes” and “Middle March”. The former carries an eminent folkish lyricism, advancing consistently at an unhurried 9/4 tempo until superseded by a middle passage that appears affiliated with world-music; the latter, one of the two compositions on the album written for Crump’s brother Patrick, is initially swamped in the lugubrious introspection created by arco bass and fingerpicking guitar, later opening up new horizons through the beautiful melody. With a sensational facility to make odd tempos sound natural, Rosetta Trio operates with a true, collaborative spirit, exploring all-string sonic possibilities with imagination. Outliers is not to be missed.